B&O was an early buyer of the Budd RDC. These cars replaced the Pittsburgh area commuter service operated with steam locos and heavyweight coaches. Ditto for service between Washington, Baltirmore and Philadelphia. B&O once ran a special high speed run with RDCs from Washington DC to Chicago and return over a weekend. With some accomodation improvements in the seats and having food service, long distance RDC runs would be possible. In 1956 B&O purchased some Budd RDC-2 units equipped with a kitchen and six dining tables seating 24. There were also 24 reclining coach seats in the car. 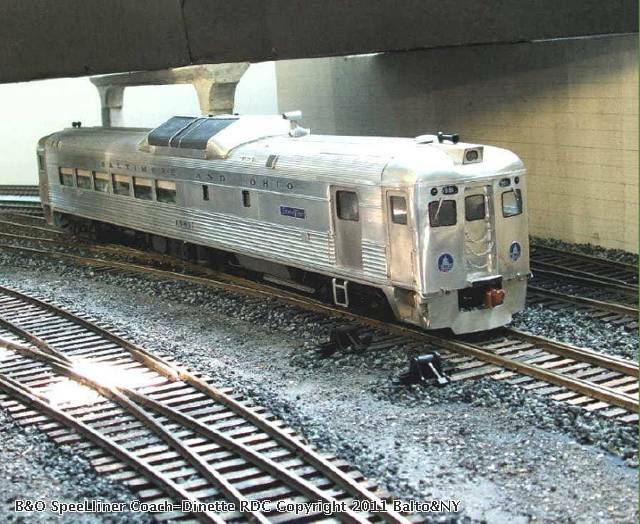 Named "Speedliners", these RDC-2 units were the lead car for RDC trains workng between Pittsburgh and Washington DC. One of these RDC-2 Speedliners also held down a connecting run to Cleveland OH which used NY Central track part of the way. This B&O Speedliner model was built from a Mac Shops kit. It is powered with two NSWL "Magic Carpet" units in the front truck and has a fully detailed interior including passengers and crew. The original Mac Shops cast pewter ends had the windows incorrect. To fix this, the openings were filed out and thin sheet aluminum veneer panels with correct window, number board and marker light openings were made from polished soda pop can material were applied. The rubber window gaskets were done with a black fine point Sharpie pen carefully run aorund the opening before the glazing was installed.